Good Morning and Happy Friday! If you're here, you know what that means — it's time for another installment of my [FRAMED] series. This one's a little different as it's not necessarily a moment, but a photo that represents a moment that happened at a wedding from just a week ago. Lets dive in. As I said, this photo is a representation of an event that happened just a week ago at the beautiful outdoor/barn wedding of Allison and Dakota. We had just finished the first meet, some quick bride and groom portraits, and were getting ready for some wedding party photos when one of the flower girls hollered out, "Hey! There's a snake over here!" The bride and I ran over to check it out and there was a little snake making his way through the grass. Allison said, "Hey, let me see that." I happily obliged and picked up the snake for her. With the snake in her hands, she turned around and said, "Come here Dakota!" and began chasing him while waving the snake. The groom freaked and took off at full speed leaving a cloud of dust. 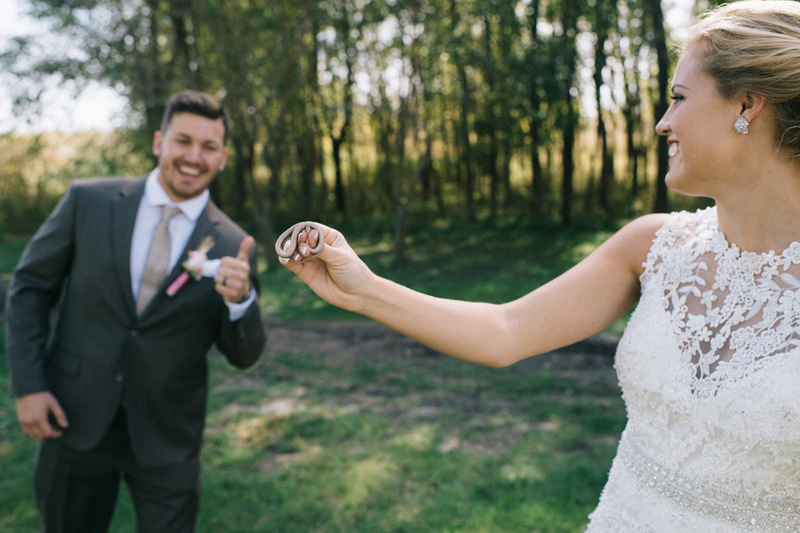 Apparently, the groom had a childhood fear of snakes that stemmed from a bad experience. So, when the flower girls said they found a snake, he was on high alert. Then, when Allison started waving it at him, he was just plain gone. So, there we stood watching the bride run after the groom while waving a cute little snake. The entire time the groom kept shouting, "Stay away from me!" and, "You can't catch me...you're in a dress!" The couple tore off across the grass moving surprisingly well in their wedding attire. The groom at this point was exhibiting some fancy footwork that would rival most NFL players — pretty amazing in a suit and dress shoes. As for the bride, she was in a full sprint with a long dress and wedges — equally as impressive if not more so. For the record, she never caught up to him. The whole escapade was highly entertaining, albeit traumatizing for the groom. However, when it was all over, we shared a little laugh, caught our breath, and convinced the groom to pose for a single photo with the snake. Well, when I say a photo with the snake, I really mean he stood about 10 feet away from it because he was too smart to get any closer. Still, it was a fun little anecdote of the wedding day and gave all of us a nice little laugh. In looking back, this was one of the funnest weddings I've been to and I can't wait to share it with you. These two were magic to work with and their venue was a custom built barn...what could be better. Stay tuned!